Brush and straighten in one! Get perfectly straight and smooth hair with Simply Straight. 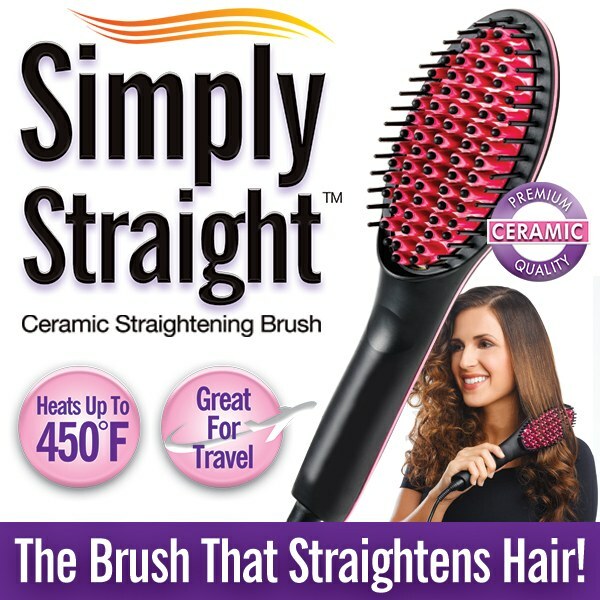 Simply Straight is the quick and easy way to get salon quality, perfectly straight hair. As seen on TV, this hair straightener brush glides through your hair like a regular hairbrush, giving you beautifully smooth, straight hair in minutes. The secret is in the special, ceramic-tipped bristles that warm up to just the right temperature and gently relax your hair as you brush. Simply Straight works great on all hair types. Pleasantly surprised. I am a new customer. I am now confident to purchase much more. I was hesitant to purchase this but now I couldn&apos;t imagine my morning routine without it. Love it. Order more for family as Christmas gifts. Does what it says. Great product! Easy to use but doesn&apos;t straighten as smooth as I like. The rubbery tips (bristles) fell out the very first time I used it.